Mulch blowing uses special equipment to blow mulch into place at commercial and residential properties through long tubes or hoses that connect back to a central truck. It is significantly more efficient than traditional mulching methods that use wheelbarrows. It is also commonly referred to as blown mulch or blown in mulch. Mulch blowing hoses are typically 4″ to 6″ wide and reach lengths of 300 feet, or more. This allows mulch blowers to quickly and easily spread mulch that is stored in huge quantities in a centrally parked truck. Trucks are typically operated by 2 or 3 man crews with one crew member feeding mulch into the machine and the other using the hose to spread the mulch. Click here to see a video of mulch being blown on YouTube. Applying fresh mulch to a property has many advantages. According to Outdoor News, these include improving soil conditions around plants that help facilitate growth and controlling the spread and growth of weeds. In addition to these benefits, a fresh layer of mulch improves the appearance and curb appeal of any property. Mulch blowing makes it easier to capitalize on these advantage, because it offers many advantages when compared to traditional methods of spreading mulch. The traditional way of spreading mulch is both time and labor intensive. This is because it requires the loading and spreading of mulch by hand. On average, a two man crew spreads roughly 8 cubic yards of mulch per hour. The biggest advantage of mulch blowing is the savings it generates by lowering labor costs. Applying mulch to a property with hard to reach areas, rough terrain, or steep slopes further increases the amount of time and labor required to do the job. Mulch blowing eliminates many of these challenges because it only requires one person accessing the area with the mulch blowing tube. In most cases, mulch blowers can reach areas 300 feet, or more, from the truck. This is just another way mulch blowing reduces the labor costs of mulching a property. Mulch blowing uses less material to mulch a property when compared to traditional methods. The primary reason is that blowing mulch breaks up clumps and allows for a more even distribution of material. Additionally, there is no spillage from trips in wheelbarrows. As a result, mulch blowing can use 20% to 30% less material than traditional mulching methods. Lastly, mulch blowing can reduce property damage caused by traditional mulching methods. There are no piles of mulch, wheelbarrows, or boards over grassy areas with blown mulch. All of this means less damage to grassy areas and overall cleaner property at the end of the day. While most landscaping contractors spread mulch, few offer mulch blowing services. This is because it requires expensive specialty equipment. Frequently, large commercial landscapers will subcontract mulch blowing to companies that specialize in the service. 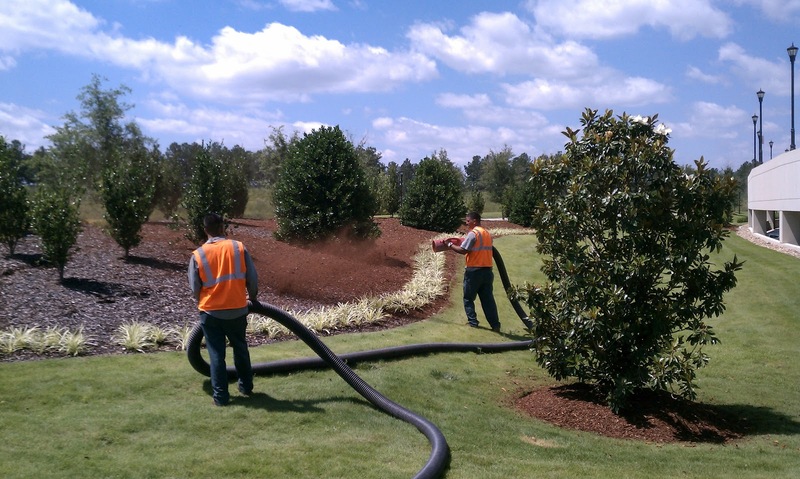 For property managers that would prefer to work directly with a mulch blowing service, the BidSource team is here to locate a provider at no charge. Just complete the form below and our team will connect with you a qualified mulch blowing service in your area!